Now that Windows 8 has officially been launched OEMs are going start flooding the market with new PCs running it. 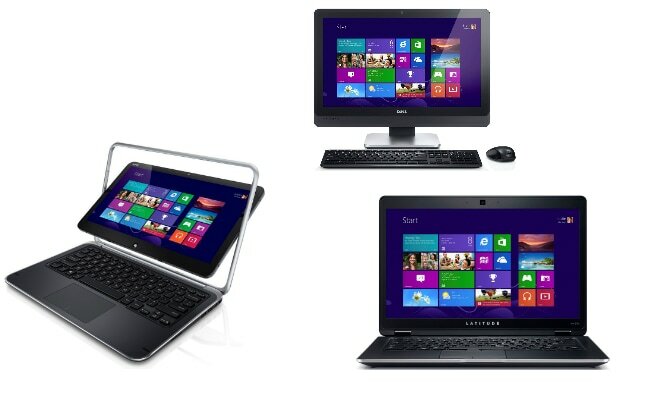 The first among these happens to be Dell, which has officially announced its XPS 12 convertible, Latitude 10 tablet, OptiPlex 9010 All-in-one, and the Latitude 6430u UltraBook. Besides this, it has also announced its S2340T multi-touch monitor that will be available next year. Starting with the XPS 12 Convertible, one will get a full HD 12.5-inch panel with a 10-finger multi-touch capacity touch display. Features wise, the XPS 12 convertible is a power performer as it is powered by a Intel Core i5 processor, and starts with 4GB of RAM, and has a 6-cell battery. It is available starting today for Rs 90,490 for the base configuration. The OptiPlex All-in-one flaunts a 23-inch touch panel, up to 16GB of dual-channel DDR3 memory, 1TB of hard disk space (Users can also configure the machine with up to 128 GB of SSD space or 500GB of hybrid memory), an Intel third generation Ivy Bridge processor starting with the i3 version and a myriad of expansion options for Blu-ray drives, DVD-drives etc. The OptiPlex will be available in the markets starting November 10 for Rs 49,990 for the base configuration. For the business professional, Dell has a more traditional offering in the Latitude 6430u UltraBook which features a 14-inch display with a standard resolution of 1366×768 pixels, am Intel third generation Ivy Bridge CPU offered in i3, i5 and i7 variants, up to 8GB of RAM and up to 256 GB of SSD storage. Dell is a little ambiguous about the official product launch as it says it will be available in mid-November for Rs 69,990. Last but not the least is the Latitude 10 Windows 8 tablet that is powered by the latest Intel CloverTrail Atom CPU that has been tailored for mobile devices. Like ARM chips for the new Atom chip Intel also uses a System-on-chip solution. Other features of the tablet include a 10.1-inch display with a resolution of 1366×768 pixels, up to 128 GB of eMMc storage, 2GB of RAM, and 2-cell and 4-cell battery options. Dell will also ship a Wacom Active Stylus that should be theoretically similar to the S-Pen found on the Samsung Galaxy Note tablets. The Latitude 10 will be available in November end starting at Rs 42,490.